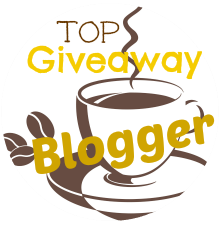 Hosted By Tammie's Reviews, Giveaways and More, Queen of Reviews, A Medic's World, Michigan Saving and More, Elite Mama and Here We Go Again...Ready? This product is nothing short of awesome! It will add flavor and a wonderful taste to all of your food. You can read Tammie's review of it by going HERE CattleBoyZ Manufactures a line of Award Winning Gourmet BBQ Sauces that are available at all Safeway locations in the U.S. The sauces come in three flavors (Original, Chipotle Maple Bacon and Sweet Chili) and can be purchased online as well. CattleBoyZ bbq sauces and seasoning/rubs are Gluten Free, MSG Free, have No Allergens. They are also quite versatile in their applications. The bottles can also be repurposed for home made wines, beers, creams, infused oils, etc. 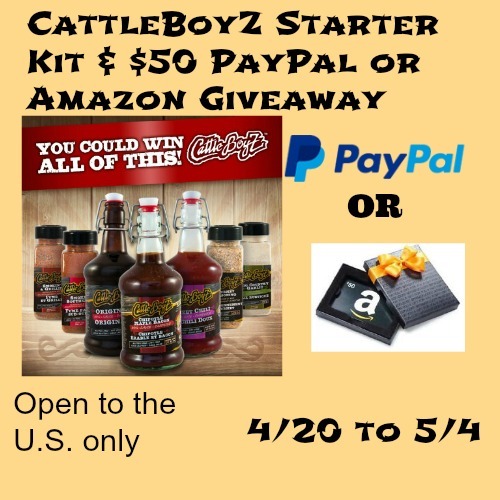 1 reader will win a CattleBoyZ Starter Kit and a $50 PayPal or Amazon GC(Winners Choice)- arv. $100. This Sweepstakes will end on 5/4/2014 at 7 p.m.
Disclosure- Couponing Momma Giveaways & Reviews was not compensated either by free product or payment. I have not been compensated for this post. All opinions and experiences are my own. Open to the US, must be 18+. Confirmed Winner(s) will be contacted by email and have 24 hours to respond before a new winner will be drawn. No purchase necessary. Void where prohibited by law. Entrants must only enter with either one email address, IP address and/or Facebook account, anyone found violating these rules will be disqualified. It is at the sole discretion of the admin of the giveaway if the winner has met the rules or not. The sponsor(s) will be responsible for product shipment to winner(s) of the giveaway. Sponsor will be responsible for prize fulfillment. This event is in no way associated with, sponsored, administered, or endorsed by Facebook, Twitter, Google, Pinterest or any other social media network. The disclosure is done in accordance with the Federal Trade Commission 10 CFR, Part 255 Guides Concerning the use of Endorsements and Testimonials in Advertising. For questions about this giveaway or to have me promote your product, Please email Tammie at info@tpankuch.com. Barbeque chicken. Nothing says winter is over like smelling bbq chicken cooking on the grill . Seriously though we love cooking ALOT of things on the grill. Its the ONLY way to cook a good steak! BBQ sauce is the best sauce there is. Barbeque is the best sauce there is. Our favorite thing to grill is chicken. My husband uses all kinds of sauces to marinate in. Would love to try these. My favorite to cook on the grill is hamburgers. I know can be boring, but not when you stuff them or use different bbq sauces, seasonings, etc. tried to go to tammys and it says Your IP 46.151.53.12 has been blacklisted! My favorite thing to grill is zucchini and I love to just put a dash of salt and pepper on them and lay them on the grill! Faye Gates...I love a good steak on the grill. I also love Bar-B-Que chicken. We have a gas grill, and cook out several times a week, in the summer. I love to grill lean,boneless chicken breast,I love to marinade it over night in the fridge,then the next day grill it with some great seasonings or rubs ,and I would love to try theses sauces they sound amazing! One of my favorites is mango teriyaki chicken over a bed of rice and veggies, it's so tender after marinating and cooking it up. Love boneless,skinless chicken breast,after marinating in Italian. i love grilling.i was grilling during winter on days that werent too cold.since spring i've been cooking all the time.i love a good juicy steak..yum.my mom loves for me to cook her wings on the grill covered in bbq sauce. A nice steak. We don't have it often, but when we do it's a big treat. Usually we just put a little salt & pepper on them. My latest favorite is cooking baked potatoes coated in olive oil and salted with garlic salt! The skin is sooooo yummy! it is the best part! I love to cook ground beef with grated onion, salt, pepper, special red pepper flake call pul biber, and a little cumin. We like to marinate chicken then grill it on skewers with onions, bell peppers, mushrooms, tomatoes and pineapple. bbq chicken breats are the family favorites to cook on the grill. I make chicken after being marinated in bbq sauce. I like to grill salmon and brush it with an olive oil marinade. I love beer can chicken! I like to grill burgers. Nothing says summer like burgers hot off the grill with your choice of toppings. I love to grill pork chops. My favorite thing to cook or grill are steaks and I prepare them medium. We love to grill chicken kabobs, with some herb marinade. I love anything BBQ lately my husband been making bbq ribs! We like to grill brats. We boil them in beer and water first, then grill. The beer gives them a wonderful taste! I like to barbecue chicken on the grill mostly. I do like shrimp on the barbie! I grill a lot of chcken breasts with a lemon garlic marinade. We grill out a lot of chicken! Boneless chicken breasts. We just season them, and put them on. We also take potato's, wrap them in aluminum foil and put them on the grill too. Corn on the cob is awesome on the grill too! YUM! I do love beer can chicken, with a delicious rub. I love pineapple and chicken on the grill. I love to grill a New York steak...medium rare. I like to grill ribs with my home made barbecue sauce. I love shrimp on the grill-seasoned with lemon pepper. I like to grill baby back ribs with plenty of BBQ sauce. I love grilling BBQ ribs. I first pressure cook them for 35 minutes and then I BBQ them on the grill. I like to make veggie kabobs on the grill! Beer can chicken is sounding pretty good right now! I also like to grill burgers once in a while. I use freshly ground chuck and season with salt, pepper and garlic. We love to grill up some steak and bbq chicken. BBQ chicken. Adding BBQ several times as it grills. I also like to wrap up potatoes and onions in foil. Yum! I love to grill chicken with a bit of Dash Chicken Seasoning for flavor. I also love grilling burgers on charcoal. I'm not a big fan of grilling but as with everything else, veggies are my favorite, things like squash and peppers. One of my favorite things to grill is London Broil - needs NO sauce or marinade! We also love grilling vegetables. Plain. Thanks for the giveaway...we love to grill chicken, rib eye steak, ribs, and beef / vegetables for fajitas; we use a variety of marinades, rubs, sauces, & seasonings...usually, the spicier (hotter) the better ! I like to grill chicken kebabs with onion and mint leaves. We love to grill pork chops and asparagus. I don't do much grilling, although I do like to eat it when others do the work. After about 60 years of preparing meals, I have become addicted to the slow cooker, and being able to just about toss the ingredients in and let the appliance do the work! We love to grill everything but my favorite is marinated steaks.